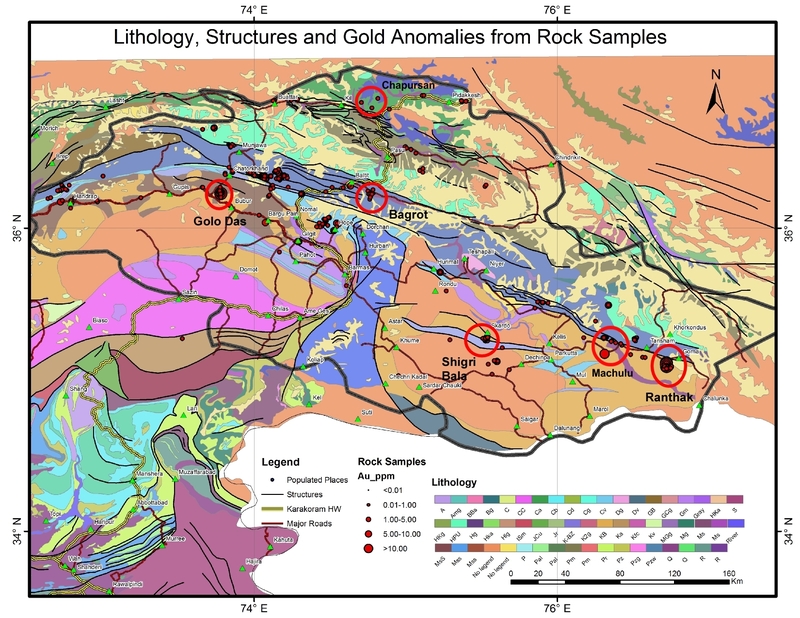 The University of Peshawar’s National Centre of Excellence in Geology (NCEG; see http://www.upesh.edu.pk/academics/researchcenter/nceg/nceg.html) has recently completed a synthesis of the entire available geochemical dataset for gold and base metals in northern Pakistan covering a period of two decades (1992-2012). During this period, more than 5,000 samples have been analyzed by various agencies, such as the Pakistan Mineral Development Corporation (PMDC), the Sarhad Development Authority (SDA) and even international bodies like MINORCO. The entire dataset was scanned, digitized and stored in a GIS database. The database also includes satellite imagery, digital elevation model data, and other related information. From this, the NCEG has identified six target areas for further gold and base metal studies: (1) Bagrot Valley, (2) Golo Das, (3) Machulu Valley, (4) Shigri Bala, (5) Ranthak and (6) Chapursan Valley (see map). According to the NCEG, these areas may hold potential for gold mineralization. On the basis of above studies, a joint National Academies of Science funded program has been started with Houston University (see http://www.geosc.uh.edu/features/geos-nsm/gold-prospecting.php). 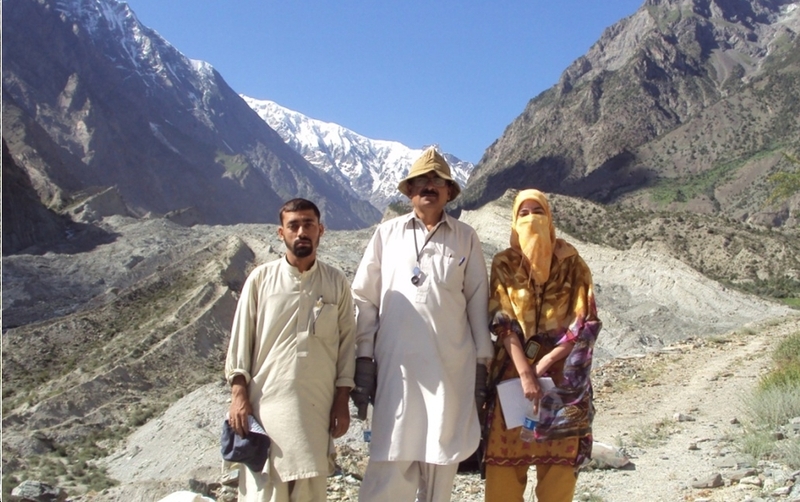 Three field trips were conducted in the northern areas of Pakistan in 2011 (see photograph). The first fieldtrip was conducted by the University of Peshawar group in April. During this trip, 30 water samples, 30 sediment samples and 25 blood, 25 urine and 25 nail samples from the gold panners and their family members were collected along the Gilgit River. During the second field campaign in June, the University of Houston group collected 40 water and 37 sediment samples along Indus, Gilgit and Hunza Rivers. The third field campaign was conducted in July by the University of Peshawar group, which collected more than 120 rock samples in four of the six identified target areas, the Bargot Valley, Golo Das, Machulu Valley and Shigri Bala areas. Currently, water and sediment samples are being analyzed at the University of Houston, while rock samples are being cut and pulverized at the University of Peshawar. About 90 thin sections were prepared for petrographic studies. Representative samples were selected for geochemical studies after proper splitting of the pulverized samples. Currently the University of Peshawar group has started laboratory work on these representative samples. About 90 rock chips have been shipped to the University of Houston for geochemical and spectral analyses. In parallel to this, remote sensing analysis is helping identify alteration zones that could contain gold. The project includes training Pakistani scientists in remotely sensed image processing and trace element geochemistry. The area’s gold panners will also be trained in safer, more efficient methods of panning, which reduce mercury pollution of river and ground water. Prof Dr Tahir Shah of NCEG, University of Peshawar, is acknowledged for providing the above information.